What is an Alpha Drive and how do I know this is what I have on my boat. Well first of all Alpha Drives are a Mercruiser product which are normally coupled with a four cylinder, V6 or a small block V8 motor. 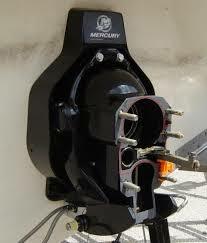 However in the eighties there were combinations with big bock V8 motors on performance boats. The Alpha Drive is the smaller drive which is easy to understand when next to a Bravo Drive. Alpha Drives are not available with dual prop. The prop diameter on the Alpha Drive is 14 to 15.5 inches. Alpha Drives are available in two models there is generation 1 drive and generation 2 drive (your drive serial number will be the sure fire way to confirm what you have). I could write a small book on the engineering differences, however we will stick to the required basics, which gen 1 and gen 2 are the same. 1- Alpha Drives have the raw water pump to cool the motor mounted in the drive between the upper and lower gear cases. ( Right in the middle of the drive cases). 2- You must shift the boat into forward to be able to remove and install an Alpha Drive. 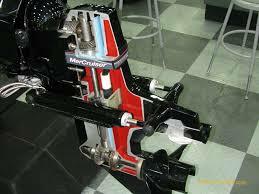 This is because the shift linkage faces forward and aft only in forward gear. ( shift dog). The shift dog is brass and if you are not in forward and pry on the drive it can end up bent. 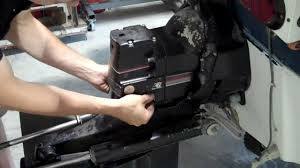 3- Remove the prop first, this will prevent the possibility of turning the prop shaft which turns the drive shaft. If you do not turn the upper or main drive shafts the drive will slide right back into place (as the splines on the drive shaft have to line up with the splines in the engine coupler). 4- You need to use Mercruiser high performance gear lube in your Alpha Drive, not using Mercruiser fluids can shorten the life of and damage the drive. 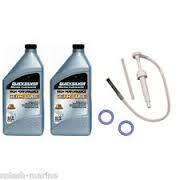 At the same time pick up some 24C lube for the prop shaft, shaft end lubrication and water pump lubrication. 5- All drives are protected by anodes to help prevent corrosion be sure you have replaced any that are in bad shape, be sure you order the correct anode package for your drive. The serial number and the water that you boat in ( fresh or salt) will determine the correct part numbers. Fresh water and Salt water require different corrosion protection. 6- Every year it is a good idea to change the water pump impellor, unless you have picked up sand or some contamination then you may have to replace the entire water pump housing. Always have a spare impellor on board and always match the impellor or water pump kit to the serial number of the drive. 8- Never sand the whole drive down and repaint just blow in the areas that need touching up and always use zinc chromate primer where needed first. As so as you sand the factory finish you promote corrosion. Before you remove the drive drain the gear oil out of the drive. You do this by placing and oil catch tray under the drive trimming the drive down until the drive is horizontal. Shift the drive into forward with the motor off. You will find two screws on the drive one down on the bullet and one near the top of the upper case, remove the bottom drain screw and then the top vent screw (if you have an internal reservoir on the motor this will drain down also. The longer you let the drive sit draining the better don't rush it. You will be looking at the gear lube as it drains out, if it is milky at all or is anything other than the color of the new high performance gear lube you have to refill it you will want to get a repair shop to check a sample of the drained gear lube and most probably the drive. ( be sure you hang onto the drain screws each one has a ring seal on it that must be replaced every time you remove the drain screw). There is the possibility that this is where the contamination is coming from and if it is this is a cheap fix. Once the gear oil is drained you can begin to remove the drive, before you remove the drive be sure you have a drive install gasket kit from your local supplier. Make sure that you give them you drive serial number so they can get you the right kit. it is a good idea to order an extra kit they are not expensive and you will probably rip a gasket on your first attempt at putting the drive back on. To inspect the bellows (the rubber boots which protect and join the outside transom shield to the drive housing). These boots wear over time, can be damaged by animals (chewed), and if water gets in the shift cable or U joint bellows it will freeze and split in the cold. If you do see water it is time to change the bellows. Gimbal bearing. This is the large bearing in the middle of the drive shaft bellows that the drive shaft slides through to connect with the coupler at the back of the motor. You can reach in and roll the bearing with your fingers it should roll smooth and easy , and should not show signs of corrosion. if it doesn't roll right or is rusty you will want to change the bearing. There are tell tail signs that this bearing is failing. ! 1- You will here a growl sound at low speed coming from the transom area. 2- A bad bearing can cause a thumping sound from the same area, these sounds will start as soon as you start the boat as this bearing is always turning. U JOINTS. The U joints are the same as you see on the drive shaft of your car. The u joints allow the drive to trim up and down. U joints also allow the drive to run while trimmed in different positions. 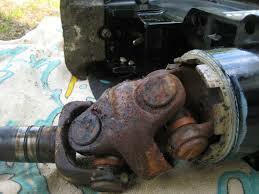 You are looking for really loose u joints (clunky, sloppy), damaged u joints or corroded u joints. If the bellows has had water in side than the u joints have been constantly wet and they will rust. If you run the boat in gear with the drive trimmed above the upper trim limit you will break off pieces of the u joint and these pieces will create holes in the u joint bellows. It is possible to explode the u joint connection if you ignore this area of the drive train. You can tell the u joints are gone when you are driving the boat and when you steer hard over you here a clacking sound. If you unsure of the condition of these parts get a professionals opinion. 1-There is an large anode on the cavitation plate some times it is flat and other times it has a small skeg on it. If you have the skeg style note the location it is mounted in as the skeg anode can be set up to take some of the steering drift out of the boat. 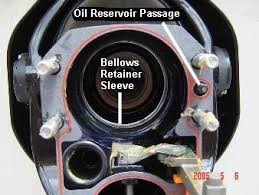 2- When the upper and lower gear case are apart you will see a small o ring at the gear oil passage that passes between the upper and lower gear case components, be sure the new o ring (orange in color) is in the correct location before you bolt the two pieces back together. This is critical. 3- If the skeg on the bottom of the case is bent or damaged now is the time to get it fixed. This damage will cause cavitation at the prop and affect performance of the drive. 4- Be sure when you change the water pump impellor you apply lots of 24C on the impellor and the housing as the grease will be the only lubrication the impellor has until it picks up water. 5- Be very care full not to over tighten any nuts or bolts pay attention to manufacturers specs. What is the worst thing that can happen if you do not service the bellows and drive? This boat sunk over a broken bellows!